I'm pulling back the curtain. I want to meet the wizard. Where do all the pieces fit? 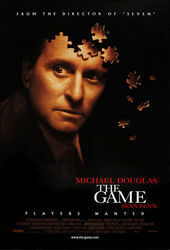 In David Fincher's 1997 thriller The Game, it's not just Nicholas van Orton puzzling through the clues – it's us, too. From the get-go, we're given hints of what's to come. There's a subtle tinkle of glass as dark puzzle pieces, designed by Richard 'Dr.' Baily, reveal the studio logos and the title. Then, a fuzzy look into a family's history. A piano plays softly and the cellophane jumps from scene to scene, an invitation to private moments and intimate gatherings – but there is something uneasy there, too. Something fraying at the edges. Director DAVID FINCHER speaks about the titles for The Game in this excerpt from our feature article David Fincher: A Film Title Retrospective. For The Game that was pretty simple: the idea of these weird home movies. We didn’t end up running titles on them — we saved them until the end — but we had the Polygram thing at the beginning with the puzzle pieces. It was just an elegant introduction to who the character is.